The Mountain Goats without guitars: What could be harder to believe? That’s how John Darnielle’s latest was billed: a guitarless album from a man who made his name strumming a guitar like he was trying to throttle it, keening slightly pedantic lyrics into the faulty tape recorder of an old boombox throughout the ’90s. Nonetheless, “Goths” is, at least thematically, classic Darnielle: a collection of songs loosely clustered around a community of people who exist somewhere on the margins of society. Most of his albums take this form. The groups range from meth addicts (2004’s “We Shall All Be Healed”) to hapless kids packed off to a punitive rural Texas boarding school (2002’s “All Hail West Texas”), to lucha libre-style wrestling (2015’s “Beat The Champ”), but Darnielle’s combination of the nerd’s perspicacity and the writer’s sympathy is notable throughout his career. Darnielle himself lived much of his early life on the margins. Growing up in the cities of Southern California, he was abused by his stepfather and kicked a bad drug habit before becoming a nurse, studying Latin at Pitzer and developing a cult following as part of the lo-fi scene of the nineties. He may have broken into the mainstream over the past few decades, but he has shed little of the essence of his past: neither his Catholic conscience, nor his sympathy for the forgotten, nor the powerful blend of sordidness and optimism that makes his music so unique have faded. There’s something fitting about how the characters are not movie stars, but struggling goth rockers. Too much art about Los Angeles either believes or parodies the idea of it as conformist, Hollywood, Beach Boys paradise, ignoring the real substance of Los Angeles, which consists of a wilderness of strip malls and low-rise developments, real people living real lives, many of them desperate under the eternal sun. Darnielle’s songwriting, always sophisticated and packed with vivid characters and imagery, is especially sharp on “Goths.” But what really makes the album shine is how the arrangements compliment his lines. 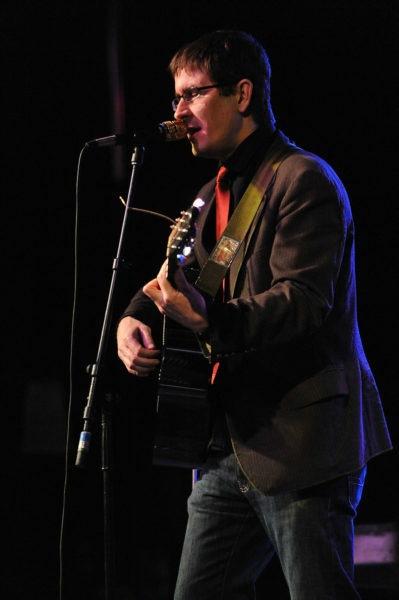 Though I was afraid that the lack of guitar as a kind of center for each piece might lead Darnielle’s songs to lose coherence like some of his past experiments with brass sections (see the title track on “Transcendental Youth”), he’s shown how much he’s learned from more than a decade of working with a band, with a set of tightly centered tracks that feel driven without need of the aid of his strumming to power them forward. In fact, the lack of guitar almost makes the songs sound less messy. Several of the tracks even border on a kind of smooth cool, which is new to the Mountain Goats, a band traditionally dedicated to raising uncoolness to the level of art. This shows in Peter Hughes’ bass on “Stench of the Unburied,” and “Shelved,” which features a compelling synth part that nicely compliments the drama of Darnielle’s line, “I’m not ready to go.” Only “Unicorn Tolerance” displays the older unvarnished side, with its dorky, obscure chorus. “Wear Black” displays another familiar Mountain Goats technique: a story in the form of a set of commands. Darnielle has employed this style at least since 2009’s “The Life of the World to Come.” It’s hard to get a handle on. When Darnielle sings, “Wear black wherever I go,” is that a command from the narrator to a second person? Is it the song’s narrator trying to bring himself under control? Maybe it’s just a declarative statement with the subject (“I”) omitted. At its worst, this style is tiresome and ambiguous, but on “Wear Black,” the subject matter is particular enough and the story – a goth rocker trying to shake his bad habits without losing track of who he is – is dramatic enough that the commands sound like incantations, secular prayers made by the narrator to the world. Also fortunately, the mandatory verses are interspersed by half-ironic, half-ecstatic visions of the narrator as a minor Los Angeles deity (“See me, guardian of the underpasses”). In a way, the song is the flip side of “Wear Black”: Instead of one man’s constant motion forward against all the arranged forces of darkness, it’s a sense that the progress forward is just progress farther away from one’s best self, one’s vanished halcyon days. “Keep going” has always been a kind of leitmotiv in Darnielle’s work, which is why the songs appeal so much to angst-ridden high schoolers, including me not so many years ago. But the opposing tendency – giving up to the past, its tireless pursuit and its tempting landscapes of memory – is always a possibility in his songs. “Paid in Cocaine” is a kind of victory of past over future, if a temporary one. Pitchfork called Darnielle “in his own private league of songwriting” in its “Goths” review, and I agree. His literary prowess and ability to transition between musical forms – as we’ve seen, from boombox and guitar to sophisticated soft-rock arrangements – might even invite comparisons to some other American titans, like a certain recent Nobel laureate. Whereas Bob Dylan was the prophet of counterculture and later the prophet of culture, Darnielle is the sage of subculture. He is the prose stylist, Dylan the poet. With his attention to detail and precise phrasing, he is more tactical than Dylan, who writes more cryptically, more effortlessly, with a kind of universality, while Darnielle is concerned with individuals, or with small groups of individuals and their particular struggles towards the light. The world chokes out its best, and we have to shed our dreams, Darnielle seems to be saying. But the ones on the margins who will never see the light of day are more worthy of honor, purer in their darkness. Like Cormac McCarthy’s bloody heroes, Darnielle’s panoply of desperates touch the heart of life in their losing battles, while the rest of us have to be content with skirting the surface, in the light-filled world of society. This is a somewhat religious view, and it may be an antisocial one, but it remains – as does Darnielle – palpably compelling and profoundly sympathetic. And “Goths,” for its part, is the Mountain Goats’ best effort in years. Contact Nick Burns at njburns ‘at’ stanford.edu. Nick Burns '18 is a history major from Ventura. He writes on rock music, the Greeks, contemporary politics, and literature for several campus publications. He also serves as Prose and Poetry Editor for Leland Quarterly, Stanford's literary review.